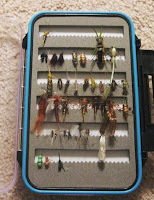 So I was in Charlotte the other day, visiting with one of the founders of TroutU when he suddenly whipped out his handy container of flies given to him by the brilliant James Marsh on their last trip to the Smokies. TroutU is always searching for the very best products to make available for it's readers. In search of the perfect flies, TroutU traveled to Pigeon Forge, TN to visit James and his wife, Angie, world famous fly fishermen. On their short visit, they couldn't fish due to rain and high waters, so they sat around coffee and talked flies. TroutU got a complete lesson in entomology with emphasis on the Great Smoky Mountains National Park, which TroutU has always loved, as have I. So when I went to Charlotte, I was given a preview of these flies. I was awestruck. I'm not much of a fisher, so I wasn't awestruck by the fly capabilities, I was awestruck by the fine art. Wow! These were beautiful!! 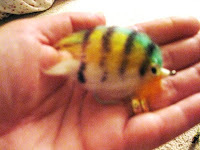 I begged Steve not to fish with them - how could anyone toss these works of art into the stream?? "But, but" he stammered, "the flies are so perfect -- imagine what we can catch with them!!" I'm sorry, my dear TroutU, but I am into art and peace. (sound like a hippie?) I like to "go fishing" only for the peace and quiet and the sound of rippling water. I don't actually fish. And now, I'm proud to say, I am into handmade flies -- for the art. These are spectacular. 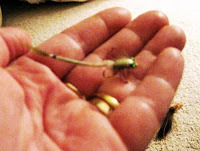 I am making a trip up to the Backpacker in Columbia to see how beautiful their flies are. Maybe I'll even buy one. Maybe I'll even start a collection - for art's sake. 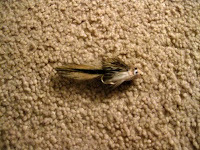 TroutU will make these flies available soon. Follow their blog on your RSS if you are interested in acquiring some. Val, I can not believe it! It's bad enough your father talks about a "sport" that few people are interested in but now he has you doing it too. I got to admit that those flies were artsy looking but I would rather look at pictures of the streams and surrounding areas than pictures of artifical flies and fish.